This is how Mike Dardaris, Chief Learning Officer of HFM P-TECH, describes his perspective on the primacy of project-based learning at his school. Dardaris’ title, a divergence from the typical “principal” moniker given to a school leader, aligns well with his commitment to creating a workplace culture through hands-on exploration and problem solving. 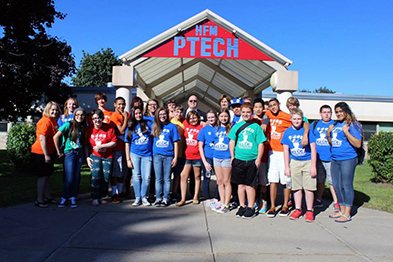 HFM P-TECH, located in upstate New York, is the result of a collaboration between Hamilton-Fulton-Montgomery BOCES, Fulton Montgomery Community College, and 16 regional business partners. Each of the many partners supports Dardaris’ vision for project-based learning because they believe that taking real-world projects and infusing them into every aspect of teaching and learning is the best way to truly prepare students for meaningful careers. From the moment Dardaris began planning for HFM P-TECH in January 2014, he knew that project-based learning would be the cornerstone of teaching and learning. He was committed to transforming the typical classroom to ensure that every piece of content taught is “applicable and interconnected.” Dardaris also knew that this would represent a significant shift for teachers and students. To prepare for the shift from traditional “desks in rows” classrooms to a project-based culture, Dardaris hired like-minded teachers and began professional development right away. Understanding that changing traditional teaching practices would require a “growth mindset”, he hired teachers who were ready to learn and experiment with their teaching practice and who grasped the importance of project-based learning to student success. He also hired a dedicated project-based learning coordinator who held professional development sessions on best practices and techniques. These staffing choices, along with the time allotted to professional development, made a world of difference in teacher preparedness prior to starting the inaugural year. Dardaris also shifted away from a traditional day of classes divided by ringing bells to a more flexible schedule that allowed for block classes that would enable project-based work. 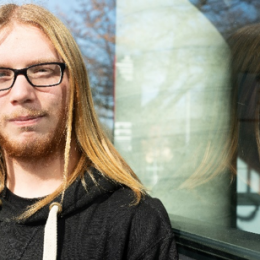 He restructured the school’s schedule into two longer periods. In the mornings, students take science and career exploration; science and Workplace Learning teachers who teach these courses are supported by math and English teachers to ensure there is connection across subject matter. In the afternoon, students take an integrated math and English Language Arts course that is driven by a larger project. This type of schedule allows for an infusion of math and English across subjects and enables students to see how everything they learn is related. For example, students may have to explore the concept of relationships across all of their courses: relationships between characters in English class, relationships between points on a coordinate plane in geometry, and relationships between two chemicals in chemistry. In project-based learning, everything is about the performance, just as it is in the real world. No project at HFM P-TECH is completed in a single daily block period. “Some people will say they did a project one day in class, but really that’s an activity,” says Dardaris. “Projects are long-term and multi-disciplinary, just as they are in the workplace.” Dardaris emphasizes that if students understand a “project” to be confined to one class period or if the project does not allow students to struggle with ambiguity and group process, then students will not learn the applicable skills of what a project would look like in the workplace. For more information about the redesigned high school experience in the P-TECH 9-14 model, please visit www.ptech.org.